A pow-wow (sometimes powwow or pow wow) is a gathering of Native Americans. It derives from the Narragansett word powwaw, meaning shaman. It has since come to be used to describe any gathering of Native Americans of any tribe, and as such is occasionally heard in older Western movies. The word has also been used to refer to any meeting, but especially a congress, a friendly gathering, or a meeting of powerful people such as officers in the military. An early twenty-first century pow-wow is a specific type of event held by Native Americans. Typically, a pow-wow consists of people (Native American and non-Native American alike) meeting in one particular area to dance, sing, socialize, and generally have a good time. Pow-wows can vary in length from a single session of about 5-6 hours to three days with one to three sessions a day. Major pow-wows or pow-wows called for a special occasion can be up to one week long. Planning for a pow-wow generally begins months, perhaps even a year, in advance of the event by a group of people known as the pow-wow committee. The pow-wow committee consists of a number of individuals who do all the planning prior to the event. If a pow-wow has a sponsor, such as a tribe, college, or organization, many or all members of the committee may come from that group. The committee is responsible to recruit and hire the head staff, publicize the pow-wow, secure a location, and recruit vendors who pay for the right to set up and sell at the pow-wow. The head staff of a pow-wow are the people who run the event on the day or days it actually occurs. They are generally hired by the pow-wow committee several months in advance, as the quality of the head staff can have an impact on attendance. The arena director is the man in charge during the pow-wow, and the rest of the head staff reports to him. Sometimes the arena director is referred to as the whip man, sometimes the whip man is the arena director's assistant, and many pow-wows don't have a whip man. The arena director is responsible for making sure dancers are dancing during the pow-wow and that the drums know what song to sing. If there are contests the arena director is ultimately responsible for providing judges, though he often has another assistant who is the head judge. The arena director is also responsible for organizing any ceremonies that may be required during the pow-wow, such as when an eagle feather is dropped. The master of ceremonies, or MC, is the voice of the pow-wow. It is his job to keep the singers, dancers, and general public informed as to what is happening. The MC sets the schedule of events, and maintains the drum rotation, or order of when each drum group gets to sing. The MC is also responsible for filling any dead air time that may occur during the pow-wow, often with bad jokes. The MC often runs any raffles or other contests that may happen during the pow-wow. The head dancers consist of the Head Man Dancer and the Head Woman Dancer, and often Head Teen Dancers, Head Little Boy and Girl Dancers, Head Golden Age Dancers, and a Head Gourd Dancer if the pow-wow will be having gourd dancing. The head dancers are responsible for leading the other dancers during a song, and often dancers will not enter the arena unless the head dancers are already out dancing. The head dancers also lead the other dancers in the grand entry or parade of dancers that opens a pow-wow. The Host Drum of the pow-wow is a drum group responsible for providing music for the dancers to dance to. At an Intertribal pow-wow generally two or more drums are hired to be the host drums, often a Host Northern Drum and a Host Southern Drum. Each drum has a Lead Singer who runs his drum and leads his singers while singing. Host drums are responsible for singing the songs at the beginning and end of a pow-wow session, generally a starting song, the grand entry song, a flag song, and a veterans or victory song to start the pow-wow, and a flag song, retreat song and closing song to end the pow-wow. Additionally, if a pow-wow has gourd dancing, the Southern Host Drum is often the drum that sings all the gourd songs, though another drum can perform them. The host drums are often called upon to sing special songs during the pow-wow. Famous host drums include Black Lodge, Cozad Singers, Mandaree, Southern Thunder, The Boyz, Yellowhammer, and Zotigh. A pow-wow is normally set up as a series of large circles. The center circle is the dance arena, outside of which is a circle consisting of the MC's table, drum groups, and sitting areas for dancers and their families. At outdoor pow-wows, this circle is often covered by either a committee built arbor, or each group will provide their own sun shade. Beyond these two circles for participants is often an area for spectators, while outside of all are several rings of vendor's booths, where one can buy supplies, food, or arts and crafts items. A pow-wow session begins with the Grand Entry, during which all the dancers line up by dance style and age, then enter the arena while one of the host drums sings a special song. Normally, the first in are veterans carrying flags and eagle staffs, followed by the head dancers, then the dancers follow in a specific order: Men's Traditional, Men's Grass Dance, Men's Fancy, Women's Traditional, Women's Jingle, and Women's Fancy. Teens and small children then follow in the same order. Following the Grand Entry, the MC will invite a respected member of the community to give an invocation. The host drum that did not sing the Grand Entry song will then sing a Flag Song, followed by a Victory or Veterans' Song, during which the flags and staffs are posted at the MC's table. 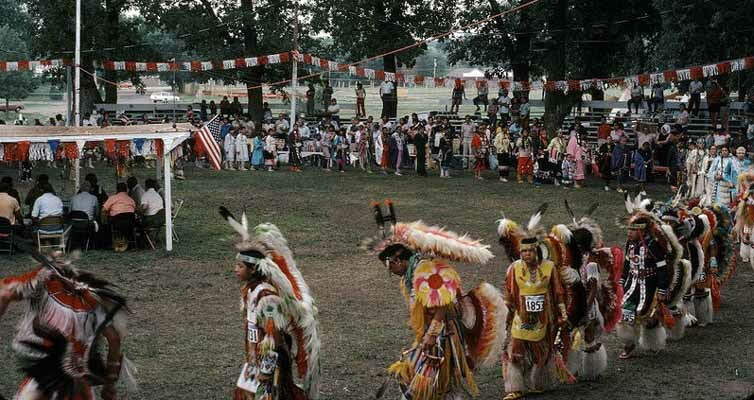 Most of the various types of dances performed at a pow-wow are descended from the dances of the Plains tribes of Canada and the United States. Besides those for the opening and closing of a pow-wow session, the most common is the intertribal, where a drum will sing a song and anyone who wants to can come and dance. Similar dances are the trot dance, called a crow hop when performed by a northern drum or a horse stealing song by a southern drum, and the round dance or side step. Each of these songs have a different step to be used during them, but are open for dancers of any style. In addition to the open dances, contests dances for a particular style and age group are often held, with the top winners receiving a cash prize. To compete in a contest the dancer must be in an outfit appropriate for the competition. Normal intertribal dancing is an individual activity, but there are also couples and group dances. Couples dances include the two step and owl dance. In a two step each couple follows the lead of the head dancers, forming a line behind them, whereas in an owl dance each couple dances alone. Group dances include the Snake and Buffalo dance, where the group dances to mimic the motions of a snake in the beginning of the dance, then change to mimic the actions of a herd of buffalo. At pow-wows where there is a large Southern Plains community in the area, the Gourd Dance is often included before the start of the pow-wow sessions. The gourd dance originated with the Kiowa tribe, whence it spread, and is a society dance for veterans and their families. Unlike other dances, the gourd dance is normally performed with the drum in the center of the dance arena, not on the side. The word Pow Wow, or pau wau, means a gathering of people coming together to trade. Explorers misinterpreted the ceremony of medicine men dancing, thinking all natives gathered to sing and dance in this manner. The modern day Pow Wow evolved from the Grass Dance Societies that formed during the early 1800's. The dances were an opportunity for the warriors to re-inact their brave deeds for all the members of the tribe to witness. The growth of reservations gave rise to the modern Pow Wow. This was a time of transition for Native peoples across North America. Tribal customs and religions were outlawed. The Grass Dance was one of the few celebrations that was allowed into this new era. The Grass Dance became an opportunity to maintain some of the earlier tribal customs that were vanishing. As other communities and tribes were invited to these celebrations, rights of ownership of sacred items necessary to the Grass Dance were formally transferred from one tribe to another. "Inter-tribalism" began to emerge with the sharing of these songs and dances. Gift-giving and generosity were integral aspects of these early festivities, as they still are today. The tradition of First Nations dance is ancient. Originally, some dances were performed before the warriors left the tribe to hunt, raid, or do battle. While the men were away, the ladies would prepare their best buckskin dresses and accessories to wear on anticipation of the party's return. This was to show honour and pride for their men. Dances were also performed when they returned, to celebrate their success. As the men arrived into the camp, the women would stand in rows, yelling and trilling for their warrior. This is the origin of the old style of women's Traditional Dance; standing in one place, keeping time with the drum by moving their feet up and down. 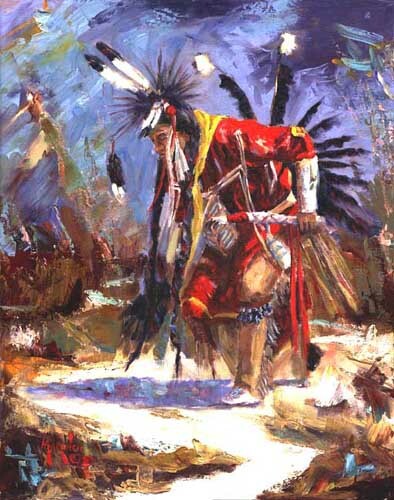 Pow Wow elders have been told by their grandfathers and grandmothers that the men did most of the dancing, only in recent decades have the women been accepted to dance among the men in the sacred circle. Hand drums and log poles were often used to provide a beat. The tribe was constantly travelling to follow the seasonal migration, making large drums hard to care for and transport. Most songs were passed down from generation to generation; some having special words that belonged to a certain tribe or nation, some containing no words. Each song is sung for a special event. There are special songs sung for traditional and fancy dance, as well as different styles of dancing, such as the Owl Dance Song. Upon contact with the Europeans, most native cultures were holding pow wows, or gatherings of celebration less and less. The pow wow is a time for renewing old friendships and making new ones. Wars were put aside to celebrate in unison. Trappers and native designers were welcome to set up their ware for the dancers wanting to purchase material and accessories to design their regalia; as it is a great pride to design you own outfit. Today, the pow wow circuit is strong and more alive than ever before. Throughout the year, in cities, towns, villages and reservations; men, women and children of all ages gather together to celebrate the traditions, heritage, and culture of the pow wow. The modern day Pow Wow bases itself on the fundamental values common to Native Americans throughout North America: honor, respect, tradition, and generosity. Along with their families, thousands of singers, dancers, artists, and craftspeople follow the "Pow Wow Trail" all over the continent to share and celebrate our culture. The modern Pow Wow has retained its traditional roots while incorporating the inheritances of an ever-changing world. This melding of the old ways with the new results in an exciting celebration that can be enjoyed by all. Pow Wows today are is a gathering of North American First Nations people who join in dancing, singing, visiting old friends and making new friends. The Pow Wow celebration is a time of preserving a rich heritage and keeping the traditional ways alive. Originally held in the spring to celebrate a new beginning of life, Pow Wows have spiritual significance. Even though most of the spiritual ceremonies for dropped eagle feather still remain today. Each session of the Pow Wow begins with a Grand Entry where the dancers in their regalia enter the sacred circle (arbor) in single file, dancing their particular dance style. Leading the Grand Entry are the flag bearers, carrying the Canadian and American Flags, Traditional Eagle Staff (Native Flag), and the flags of other participating nations. Following the Flag Bearers are the members of the Pow Wow Royalty. The Men's Traditional dancers - protectors and preservers of the traditional ways; with their double eagle feather bustles and their high kicking steps. Next are the Men's Fancy dancers, recognized by their colourful regalia. The Men's Grass dancers with their striking outfits covered with long, colourful fringes follow. Their dance movements are a sliding, shaking, and spinning motion, similar to long grass blowing in the wind. Teens, Juniors and Tiny tots follow in their respective categories. Following the male dancers are the Women's Traditional dancers, who dance in a stately and poised manner, moving slowly and gracefully to the beat of the drum, dressed in elaborately decorated regalia with Eagle plumes worn on the back of the head and an Eagle fan in the right hand. Next are the Women's Fancy dancers, whose long, graceful fringed shawls are draped over the shoulders. Their twirling rapid dance steps compliment the flaring shawls. The Women's Jingle dancers follow, originally from the Objibwa Nation. This dance is recognized as a healing dance. The dress is covered with tin cones (made from snuff tin covers) and bouncy dance steps create rhythmic jingling in time of the beat of the drum. Again, teens, juniors and tiny tots follow in their respective categories. After all the dancers are in the arbor, a flag song is sung, then a victory song. The flag bearers then proceed with the flags to the front of the arbor. After Grand Entry an opening prayer will be offered in a native language or in English. This is done out of respect for the flags and our traditional ways. It is very important for spectators to rise and remove their hats during the prayer. After the prayer, the opening song starts the Pow Wow. Now the time to enjoy the Pow Wow has arrived. Going back to the early days of the fur trade, the Pow Wow tradition is an integral part of First Nations Culture and the history of Canada. Pow Wow celebrations are an invaluable experience which will enable all participants to better understand the important part traditions play, and how these traditions define indigenous culture. Pow Wow participants and spectators must abstain from drugs and alcohol and demonstrate sincere respect for older and younger generations. Dancers will participate in four separate categories: Traditional, Fancy, Grass and Jingle. Over 300 First Nations groups from all over North America have been invited to participate in the Annual Pow Wow. Over 100 dancers are often in attendance each day of the Pow Wow. In addition to the traditional dancing, drums, and Princess Pageant, other events and activities include craft and food booths, traditional bannock, pancake breakfasts, various draws and raffles, and a souvenir program book. All guests, participants and visitors are expected to show proper pow wow etiquette and subscribe to the rules and protocol that the pow wow circuit follows. All Pow Wow Festivals are Alcohol and Drug Free. Pictures during the Flag, Prayer, Honour Songs and when an individual is honouring a drum through a whistle- should not be taken. Guests are asked to stand and remove your hat for certain songs. You do not have to remove your hat if you have an eagle feather in it. Tradition is to respect visiting chiefs and elders by giving them priority for all matters of etiquette. Do not crowd around the drummers. Always ask for permission before making any recordings. Children are welcome to enjoy this event, but cannot play in the Sacred Circle. Participants are asked to respect the arena director, head dance man and woman head dancer. Respect the work of the security committee as their time is valuable. Heed what the master of ceremonies states during the pow wow.